Psalm 139 is precious to me. If you’ve read it, you may have found a deep personal connection to it as well. Recently I’ve been turning something over in my mind when it comes to my identity, and that brought me back to this psalm. Most of the time it’s not difficult to imagine the All-knowing God having knowledge and awareness of people and events. Omniscience seems easy to attribute to the One who made all things and rose from the dead, frankly. I’ve spent decades studying the Bible, and His power is written all over every page. The last twenty years have been full of gratefulness because I’ve grasped more of the incredible love Jesus offered to everyone at the cross. But there’s a precious distinction between “knowing all things” and “knowing everything about me.” This is where it gets personal. In nineteen years of marriage, I see my husband has intimate knowledge of much of me. Compared to his knowledge, my Abba’s is overwhelmingly more detailed and deep! He knew I would live so many days trying to figure out who I was, who I was created to be, and why I existed. He waited, patient and excited, for the day I would pick up the colored pencils and discover what He’d always known—that, with Him, I can draw beautiful things. He knew I would be the thinker who wrestles with heady concepts in a “hack” sort of way, hopes to grasp who He is deeply, and lives in her head. Yeah, all that and the stuff I haven’t begun to discover about me. So where do I land with Psalm 139? 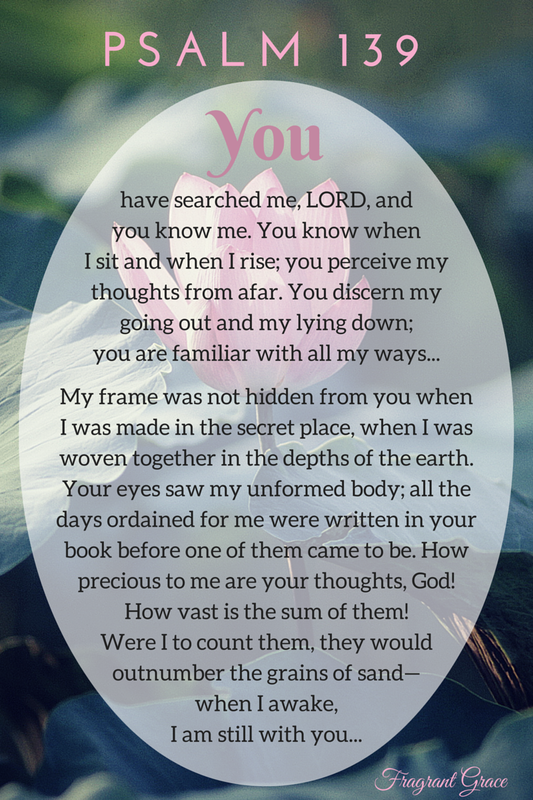 With my Abba’s intimate knowledge of me, it only makes sense that I ask Him to show me who I am and how He’s wired the inner workings of my soul. Pairing that knowledge with His infinite wisdom is my only choice. He knows me, the entire timeline of my life, and the potential and purpose threaded through all of it. Life with purpose. I want that, and He promised I could have it. But how do I “do” that kind of life? I think David says it perfectly! So that’s me, but it’s you, too! Think about it. He was intimately involved in who you are and your life, as well. What do you think about that? I’d love to hear your thoughts! Comment below, at the Facebook page, or on Twitter. Made me tear up! I havent thought of how God thinks of me as yet – that pertains to me. This is the psalm that brought me to the Lord. That’s grace for sure! Thanks for stopping by! I think it’s fun to hear the beginnings of our stories with God. All different. All wonderful! Nice to meet you, Heather. I just love how you brought this psalm to us, revealing what a precious privilege it is, that we are offered access to an intimate relationship with our Heavenly Father through Jesus our Savior.